Below is the abstract and a short synthesis of my PhD – “Shelf edge exchange and the influence on coastal oceanography”. You can download a PDF version of my PhD here. The shallow waters west of Scotland feature strong variability in water properties on a variety of temporal scales. While the region is known to be subject to both coastal and oceanic influences, the causes of variability are poorly understood. The limited characterisation of changes in coastal waters impacts our ability to explain the behaviour of coastal ecosystems, and predict their resilience to future climate scenarios. This thesis uses historical data in conjunction with recent cruises and a coastal mooring to investigate the causes of variability in the waters west of Scotland. 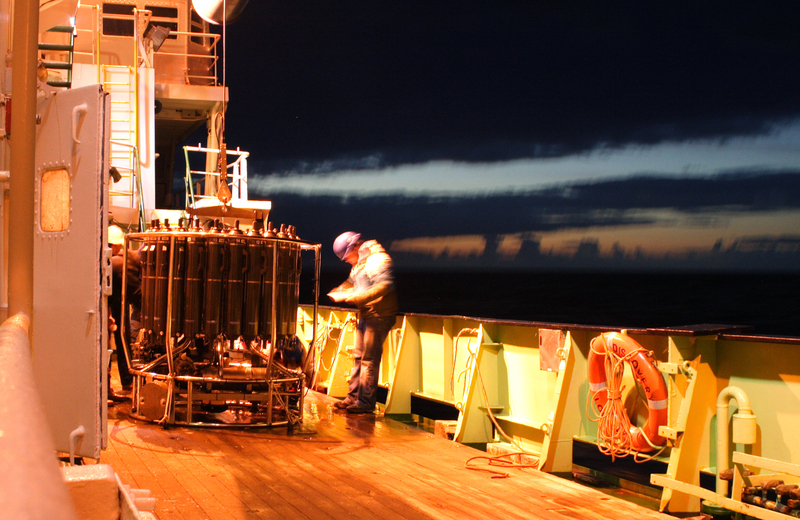 Two new inter-annual salinity time series on the European shelf are developed. The spatial variability in salinity in shallow waters is greatest during winter and increases by a factor of four between the shelf edge and the coastline. At the shelf edge, new observations of the along-slope current suggest that it is stronger but less stable during winter, leading to a greater availability of oceanic water on the outer Malin Shelf. However unlike other documented shelf regions, shelf edge processes do not directly influence Scottish coastal water properties. A baroclinic current originating in the Irish Sea is the main influence near the Scottish coast during quiescent periods, but wind forcing dominates shelf processes during most winters, with prevailing winds tending to drive oceanic water towards the coast. While salinity in the Sea of the Hebrides is moderately correlated to wind, coastal salinity is sensitive to both advective processes and freshwater runoff. On inter-annual time-scales, salinity on the Malin Shelf is higher when the North Atlantic Oscillation (NAO) is positive, whereas the northern Irish Sea is fresher during a positive NAO state. Salinity and flow pathways in Scottish coastal waters appear to be resilient both to changes in the Rockall Trough and a warming climate on decadal time-scales. In UK waters, the continental shelf extends 100-200 km west of the coastline. Between the coast and the edge of the shelf the sea is roughly 100 m deep, and behaves very differently to the abyssal ocean. Tides and currents here are strong, and surface processes can exert an influence down to the sea-bed. In the winter, the friction of strong winds on the sea surface can displace large quantities of water and disrupt flow patterns, whereas in the summer the sun heats up the coastal waters, increasing the buoyancy of the surface layers which allows areas of the ocean to stratify (to form layers). Life is abundant due to the constant supply and mixing of nutrients, and the UK fishing industry is reliant on the continued health of the shallow seas. Map of the European continental shelf to the west of Scotland, showing several key datasets used in my PhD thesis. Abbreviations: CS: Canyon System, IF: Islay Front, SCC: Scottish Coastal Current, TPM: Tiree Passage Mooring. Arrows show main current pathways on shelf; black: water originating in the eastern Atlantic; grey: coastal water. Beyond the edge of the continental shelf, the depth increases rapidly from 150 m to 3 km. The conditions in the abyssal ocean are in stark contrast to the shallow seas: beyond a few hundred metres depth there is little light or life. The currents and waves driven by winter storms cannot penetrate deeper than 600 m and the tides, distributed over the full depth of the ocean, are much weaker. In the Rockall Trough to the west of the UK a broad, continuous current carries warm, salty water from the Atlantic northwards towards the Arctic. Here it is cooled and freshened by interaction with the atmosphere, precipitation, melting ice and river output before returning south along the east coast of Greenland. The exchange of waters between these two regimes is not well understood; there is no physical barrier between the deep ocean and coastal waters but we know that the shelf-edge current can sometimes block the free interchange of water. The aim of my PhD was to combine millions of historical observations with modern techniques to build up a long-term picture of the shelf-edge, and provide a better understanding of the conditions which force Atlantic water onto the continental shelf, or confine it to the abyssal ocean. I also investigated processes which transport water from the shelf-edge to the coastline, influencing the long-term temperature and salinity observations at the Tiree Passage Mooring in the Inner Hebrides (see map). This is a time-series of temperature, current velocity and salinity observations in an energetic coastal environment over a 40 year period to present, and is a valuable record of the changing Atlantic climate. There is recent evidence, for instance, of a slowdown in the transport of warm water to the Arctic, which may impact UK coastal waters. However I found that because this region is flushed both by coastal waters from the Irish Sea and oceanic waters from the Atlantic, much of the long-term climate trends are masked by year-to-year changes in local wind-driven currents. I developed a simple statistical model to relate the wind forcing to the origin of water at the Scottish coastline, and found that the strongest influence on water properties was the frequency of winter storms. Salinity makes a good tracer of the water’s origins, but the findings can also be used to track pollutants and organisms. For instance the summer of 2015 was particularly cool and wet in most parts of the UK due to the frequent transit of low-pressure weather systems. The old RRS Discovery, from which some of this work was conducted, in Southampton Dock. My findings suggest that this would result in an unusual intrusion of Atlantic water towards the Scottish coastline, and we are currently investigating whether this can be seen in the distribution of marine life over the region. This project may also contribute to our understanding of the east Greenland coastline where the ice sheet meets the ocean. Glaciers continuously flow into the sea; they melt and fracture due to warming both from the atmosphere and sun above and the ocean below. An increase of warm, oceanic water reaching the base of a glacier may have the dual consequences of increased melting from below and a lubricating effect between the land and the ice where the ocean undercuts it, accelerating its flow. This project was part of the 4 year FASTNEt partnership (http://www.sams.ac.uk/fastnet).